It proved to be a challenging design, with many financial and environmental constraints. Our team pulled together and worked with client to create a successful design first time and the project was constructed without any issues. 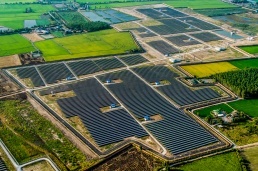 The solar park now provides 40 MWp of power to the national grid, enough to power approximately 20,000 homes (using 1MW = approx.. 500 homes), adding to the effort to replace fossil fuel power plants in the UK. One of our main considerations when taking on a project is sustainability. We ask ourselves these questions: how will it improve the environment and what effect will it have locally? In 2017, we took on this project in, UK. It proved to be a great asset for environmental improvement and had a positive effect on the locality as it was based on an old landfill site and provided 7.43 MWp of energy. Challenges such as excessive wind loads and the presence of gas pipelines made this project uniquely difficult. Our team of professional and experienced engineers managed to come up with a design that complemented the landscape and was delivered successfully first time. In 2015 we were asked to create a conceptualization of a 10MWp solar park in rural England, near the tranquil town of Horslund. We created a series of design upgrades, meaning the solar park now covers a total area of 68500 square metres, containing almost 40,000 individual solar panels. The project has had a positive effect on the local environment, making enough energy to power approximately 5000 homes. This rooftop PV array provides West London’s largest wholesale market with half of its energy needs. We are proud to have designed this system of 60669 panels and four 60kW lithium batteries, as it’s helping to create a cleaner environment in England’s capital city. This project creates 1.73 MWp of clean, renewable energy. 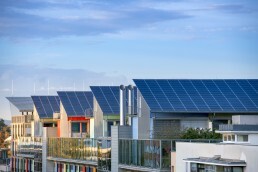 Solar energy provides benefits for everyone, not just big companies and energy investors. In 2017, we helped a secondary college in Australia with their aim of contributing towards a sustainable future. The solar arrays on their campus rooftops have enabled them to generate 300 kWp of clean, renewable energy. Sony approached us to design rooftop and façade arrays for their buildings in the UK, as we have an experienced team that delivers excellent results. A popular global company like Sony are careful about who they chose to work with, so we are honoured to be working closely with them to create a cleaner environment. So far we have helped them to generate 160 kWp of green energy at their UK headquarters. 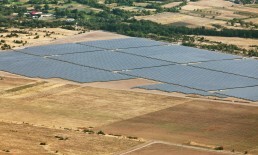 Open air car parks are prime locations that can be harvested for solar energy. Clean energy can be generated whilst also shading cars. We have worked with companies in the UK to create carport solar projects that are generating 102 MWp of renewable solar energy so far.